The Sartorialist: Do You Know How Much Collar You Can Handle? Do You Know How Much Collar You Can Handle? I have written a lot about the "proper" amount of cuff to show with a suit. If your neck and face can handle it, I also love a dramatic amount of collar over a jacket. Again it is all in relation to your size but it does really finish off a look. I wish I had a better shot of this but when i look at this image all I can see is that great collar. Comments on "Do You Know How Much Collar You Can Handle?" so much texture in this picture! from the wrinkles on his hands, to the stitching in his jacket and the design on his tie. phenomenal. Gorgeously done! You are right about the collar. I love it. Absolutely beautiful photo, Sart. Well done! I'll raise my wine glass to you on this one. I love the spread collar, black knit tie, grey flannels. I don't mind the pairing of the dark blue & black here. A pocket square would have been a nice touch. Classic. The spread collar here looks outstanding, though I understand many American men aren't familiar with the spread collar. I think spread collars look best on men with narrow head shapes. Guys with pumpkin heads should stick to forward point or button-down collars, IMO. To top it off, this gentleman sports what I call a cavalry officer's haircut, or an aristocrat's haircut. Worn slightly longer, it is brushed back and has 'wings' at the side. Superb. I adore that type of collar. Some of my shirts (though I wish more) are like this. This high and wide collar is markedly an Italian phenomenon. However, I can honestly say that only a select few stores provide this exact kind of style. I often find that shirts marketed as Italian style, do not have a high enough collar stand (though the spread is certainly wide enough). The collar, thorough large, isn't itself a problem; rather it's the collar plus ill-fitting jacket, which is, among other things, coming away from the back of his neck. In any case, one want to avoid the Lagerfeld collar effect, in which the collar creeps up the neck. It's Edouard Vermeulen, a famous belgian fashion designer (for Natan). He has a great style, very stylish, very classic too. He dresses a lot of queens and princess in Europe. Is his jacket a three button without a top button? The lapel confuses me. I'm usually critical, but this look has won me over. The not-too-dark blue of the jacket, with pick-stitching and patch pockets, works well for him, and I mostly disagree with Butch about the fit -- probably the jacket collar has pulled away a bit from his neck because he's pulling his arm back (albeit it's not ideal). Personally I don't think the shirt collar should be the focus here; it's more the overall look. And I thought (or hoped) the silk knit tie was very dark green, which would be way more interesting and sophisticated than black -- Sart, which is it? Are we looking at the same picture. That is hardly an ill fitting jacket. Sure we have some light cats whiskering at the button - maybe hes put a little (i emphasise a little) weight. But to say the jacket is standing away from his collar is nonsense. Do you clothes stick to you like glue when you move - if they do you should change your outfitter. And Lagerfelds collars dont ride up his neck. They are designed to fill every inch of his neck (llike an 18th centruy toff) from collar bone to jaw. They have nowere to ride to.... Comparing this dapper gents perfectly normal (for italian businessmen)collar with lagerfeld's whimsies is like comparing a beautifully made pair of italian wingtips to platform boots. It's indeed Edouard Vermeulen of the Belgian house of Natan (http://www.natan.be)! In my opinion, as someone other has said here,the picture focuses are the tie and the jacket. 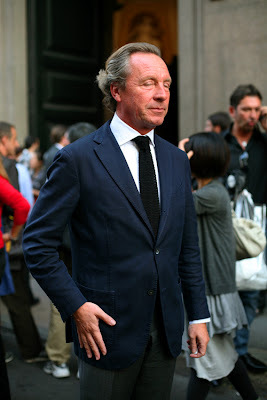 A great example of sober elegance in terms of fabrics,cutting style(the jacket has all the features of neapolitan cutting such as three buttons roll to two, high notch lapels,pacth pockets with a cut breast pocket) and colour matching (blue and navy).The innate natural elegance of the person adds the final touch for a superb result. Yeah, whatever. Collar, the length of sleeves under a jacket. Have you ever considered there are more important things in life to obsess over? thanks for your helpful insight and push into a new and even more complex and involved sartorial quest!!!! Peachpit, it's not either-or. You're concerned with world hunger (for example) OR you're involved with dress details: that's your option. The world is a big, big place and encompasses--well, the world. There are many choices to make--making one over here doesn't mean you can make another (and another and another) over there AT THE SAME TIME. As for the spanning at the button; well, call it the result of the wearer's avoirdupois--hard to make a definite decision about it if we don't know when the jacket was fitted. By "collar creeping up" I was speaking figuratively; of course Lagerfeld's collars are DESIGNED to look the way they do. Unfortunately, in my opinion. I'm a big fan of the Spread collar and I can't stand the American forward collars. But it looks like he's wearing a Black silk knit tie with a Navy jacket...isn't that a no-no? Yeah!!! Edouard Vermeulen c'est bien de voir des Belges sur ce site!!! Interestingly, every time I go to Italy (at least four times per year for work), what strikes me is the lack of spread collars and the preference for a slightly narrower, soft yet high collar. Granted, I spend most of my time in Rome and south, so I don't get to Milan much, but the Southern Italian men do not seem to have a preference for the wide spreads often shown here on your site and also pitched as the "Itlalian collar" in US retailers. i can only hope to be this cool when i'm his age! classic and modern, all at once. up to date without dressing to young for himself. some people really just "have it" i guess. Look at the many photos of Prince Charles, for example. Regardless of what you think of the man or his style, there can be little doubt that the best cutters in the world at A&S are fitting his suits. Yet, in many candid images, the pants can look a tad long, the jacket puckering a shade here and there. That's reality--a place the Sartorialist has clearly chosen to stake his artistic and stylistic ground. And for that, I'm glad. This brings up an issue I deal with on a regular basis. Maybe someone here can help me. I'm tall (6'2") and skinny (15" neck). I usually wear ainsley-cut collars (somewhere between a forward point and spread). I simply can't kind sport coats that cover the ends of my collars (undoubtedly because my neck is so small). Even a 38" regular coat doesn't do it. Any advice? Perfect collar. He is really elegant. I think it's a Boglioli Coat. handcrafted and specially washed in Naples. they also make Suits. perfect.